As phone numbers of sellers displayed on signs proliferate in the Svay Chrum commune where, since 2013, the government has been planning to build a bridge linking the Mekong river from west to east, speculative sellers are still attempting to cash in on unconfirmed infrastructure projects in the area. Chan Sovan, who owns a five-hectare piece of land at Svay Chrum and nearby Areyksat village with part of his family, said he asked his family and friends to buy land there in 2013 because he suspected the area would increase in value. “My family and I bought five hectares [of land] from a villager in 2013. It cost us $35 per metre square back then, but now it is almost $200 per square metre for the lake and farm land, and maybe there will be even more increase in the future if people come to invest after the national elections next year,” Sovan said. 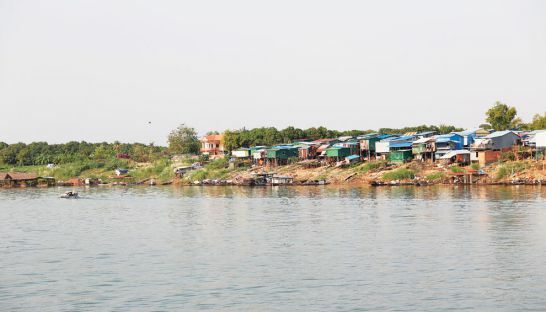 While speculation about a bridge being built to connect the Svay Chrum commune to mainland Phnom Penh city has been ongoing for years, Sovan maintained that regardless of the bridge, the prices of land in the area will increase over time. “We decided to buy without discussing with any experts but we believe it is fine to estimate ourselves,” he said. Kim Heang, president of the Cambodian Valuers and Estate Agents Association (CVEA), said land prices in Phnom Penh traditionally start to boom from word-of-mouth and speculation of infrastructure and residential developments. However, most of the time, Heang acknowledged that amateur land and housing investors fail to do any formal research or consult an expert in the real estate sector. “It is risky to invest in land or housing if they want to make a financial benefit without doing certain research and consultation,” he cautioned. In general, Heang said taking rumoured information on land and house prices at face value was a gamble but could pay off, noting that five years ago was a good time to buy in the Areyksat area when the rumour mill was rolling. Nonetheless, prices have now levelled out. Heang, a professional in the real estate business for the past ten years, advises potential buyers and investors against jumping into a land purchase in an area that does not have clear development plans. He also said people needed to be more open-minded when it comes to doing personal research. “Less than 10 percent of people make use of expert real estate consultants to research and criticise on land or housing, and instead rely on word-of-mouth through family and friends. On the other hand, foreign investors ask for 100 percent standard service from professional property consultants,which pays off,” he said. According to Heang, the nature of land transactions in Cambodia work in a way where land prices most usually increase when there are rumoured plans for surrounding infrastructure. He gave the example of the Prek Tamak Bridge in Kandal province to show the level of exorbitant price increases that can occur for resale purposes. When the bridge development was announced in 2007, Heang said the government had proposed accompanying developments such as shopping centres and schools which resulted in land prices skyrocketing from $1 per square metre to $40 per square metre. Fast forward to 2011 when the bridge was completed, no subsequent development ever took place, resulting in the struggle faced by people in the area who are now still desperately trying to sell off their land. Meanwhile, in Areyksat, Thol Than, who frequently travels on the ferry from Areyksat to get to his home town of Peam Okha Ong village, has personally witnessed prices in Areyksat and nearby areas increase consistently over the past years. “We are happy to see development in this area but we are also concerned about land prices which have gone up to the maximum these last three years when we heard the plan to build a bridge across the river,” Than said. According to Than, land in a portion of Areyksat village which boasts a lake cost a shocking 30 cents per square metre a mere five years ago, but has today shot up to about $40 per square metre. For the Areyksat area, Heang said sellers have been attempting to establish a resale price 30 to 50 percent above the real value. Not everyone has struck lucky when it comes to purchasing land on the uncalculated gamble it will increase in price. Leng Samnang, a land owner at Baseth district, said he invested in the area in 2008 when he purchased a hectare of farm land which cost $1 per square metre. “My nephew told me to buy [the land] in 2008 saying it should possibly increase in price today and in the future, but I still keep it because there is not much difference from the first price,” he said. Despite little movement in the value of the land in nine years, Samnang is still hopeful on getting a return and will consider placing the land up for sale if he is able to get a buyer to pay $5 per square metre. MLMUPC spokesman Seng Lot, while unaware of any official plan to build the Svay Chrum bridge, said that the buying or selling of land is at the discretion of people given Cambodia is a free market, adding “there is no law to prohibit people’s benefit”. “We can only advise them accordingly to avoid buying unlicensed land, and land in conflict.”. *Some names have been changed to protect their identities.